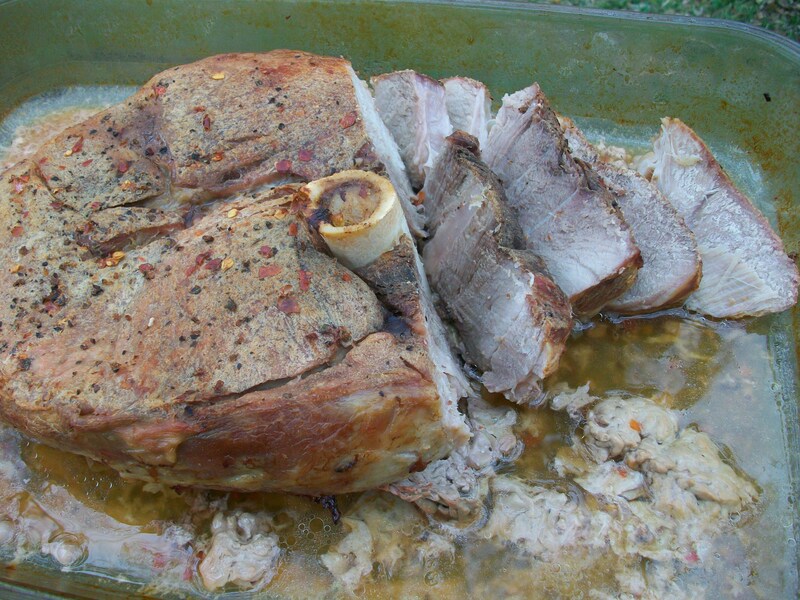 For the last few years, our ham roast recipe has been the number one ham roast recipe on the internet. If you performed a Google, Bing, or Yahoo search for “ham roast recipe” or one of many variations on ham, Four String Farm would appear at the top. In the case of Google, that was first out of more than 7,200,000 results; and for Bing, first of 16,600,000 results. We didn’t do anything to promote this recipe. We simply posted it a few years ago, along with an article called Ham is for Luck on New Year’s Day, and the recipe took off. Incidentally, the article about why ham is lucky on New Year’s Day also ranks very high in searches on this topic. Since that first ham roast recipe, we have developed numerous other wonderful recipes to cook our hams, including this variation by our friend Kimmi. However, once a site becomes popular on the search engines, it sort of takes on a momentum of its own. Now, it turns out that Paula Deen, that honey-voiced maven of Southern Cooking, has taken over first place in hams! Martha Stewart and her famous hams are still in the running but trailing behind. We are very honored to be in the search engine company of the likes of Paula Deen and Martha Stewart! This recipe is popular because more and more people want to know about chemical-free free food, and how to get back to wholesome cooking. They want to know why wholesome food tastes so much better than inferior conventional products. Because of our ham recipe, our web site has received tens of thousands of hits from people looking for a recipe, or who are interested in pastured pork, or have questions or information to share with us. Additionally, I have had requests from folks all over the country, from California to Vermont, asking us to ship them one of our pastured ham roasts. However, we do not sell our food in this way. I ask these folks to take the time to find a local farmer who produces chemical-free food, and to shop with that farmer. Both the farmer and the customer will benefit from that relationship, and the customer will enjoy a continual supply of fresh, delicious, wholesome food. In South Texas, you can only get your pastured hams from Coastal Bend Health Foods in Rockport. And Kimmi is offering these beautiful hams for 10% off between now and the New Year. And please note, we now have new packaging for our pork roasts, ribs, bacon, and ground pork. We have switched to this superior grade of vacuum packaging to lock in the freshness and to better protect the product. I invite you stop by Kimmi’s store soon to pick up your ham and to shop for your Christmas and New Year’s dinner. Kimmi has some recipe ideas for you. But of course, you can always Google search a popular recipe! This is really interesting. When I went back to Council Grove, Kansas in October, I wanted to eat at the Hays House. Established by Seth Hays in the days of the Santa Fe trail, it’s the longest continually-serving restaurant west of the Mississippi. Their specialty is Beulah’s Ham, and everyone raves about it. So, I ordered it. My gosh, it was good. In fact, it was the best I’d ever tasted. I even shelled out the dollar for a laminated recipe card to bring home and try. What’s interesting is that, even though the marinade used is different, the technique is exactly the same as yours, up to how high on the ham the marinade should come in the pan and the foil. The temperature’s a little lower and the cooking time a little slower, but that’s a small difference. I have a feeling that combining Beulah’s recipe with a pastured ham would be nigh unto heaven. I think that goes on my list of New Year’s resolutions. And now, if I can’t find a ham here, I know where I can get one. That Beulah’s ham sounds good to ME! Thanks for telling me about that restaurant! If we get up that way, Kayla and I have to try Hays House. As you can imagine, we cook a LOT of hams! We have modified that recipe numerous times, and need to post some more of the variations. We are cooking them longer at a lower heat. Also, we have several different rubs we like to use. One thing we also do, instead of turning up the heat at the end to brown the ham, is to sear the ham on very high heat in a cast iron skillet on each side, then put it in to cook. Thanks so much about the tip about Hays House! I would love to know the recipe for the marinade for Beulah’s ham. Have a wonderful day! Hello Carol! Thank you so much for your interest! Kayla and I have seen your art at Wind Way and the Center for Arts, and we love it! I will touch base on your e-mail. Have a wonderful day!